Versatile, capable, sporty, and fun, these Rigid Inflatable Boats (RIBs) are worth a second – and a third - look. If you think RIB boats (rigid inflatable boats) are just toys for the bathtub or a bunch of crazed Greenpeace activists, think again. High-tech fabrics and materials have been combined to create some of the toughest and most practical vessels on the water. 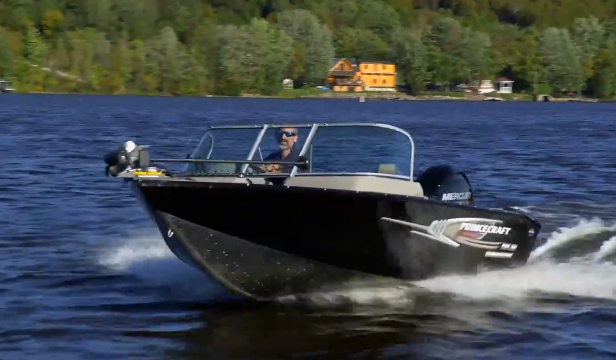 Yes, RIBs tend to be lighter and have less deck space than a traditional boat, but the stability and ease of handling they afforded is addictive. Here are five RIBs that are too cool to pass up. 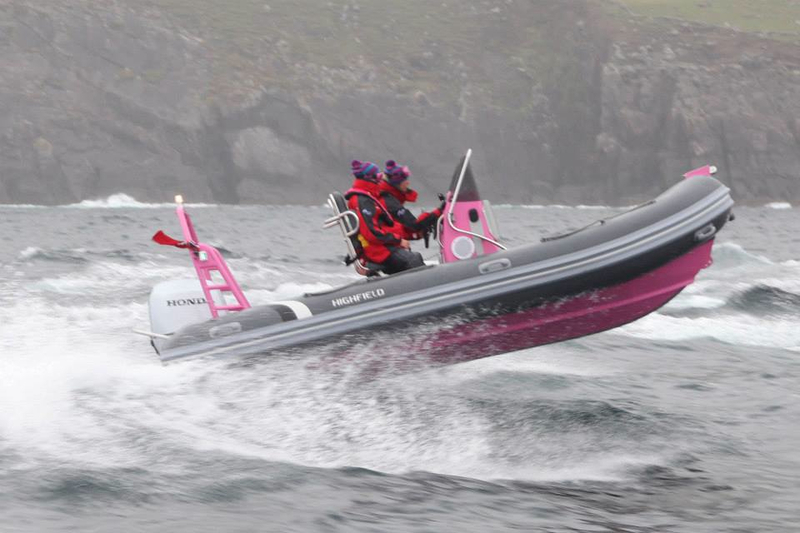 Team Pink Panther made it through the Round Ireland Endurance Challenge, in this rockin' RIB. The waters of the North Atlantic have tested - and bested - many boats, but the Highfield OceanMaster 500 thrives in these extreme conditions. Powered by Suzuki outboards, two OceanMaster 500s recently completed the Round Ireland Endurance Challenge. Operated by two teenage girls, the Team Pink Panther OceanMaster 500 was among the smallest entries, yet it made it to the finish line despite Force-7 winds and outrageously high seas. The powder-coated aluminum hull matched to five airtight chambers crafted from virtually indestructible ORCA fabric allowed for great fuel economy as well as structural rigidity and a stable ride, for the 16' long, 7' 1" wide, 555 pound boat, as it made its way around the 1,100-mile course. 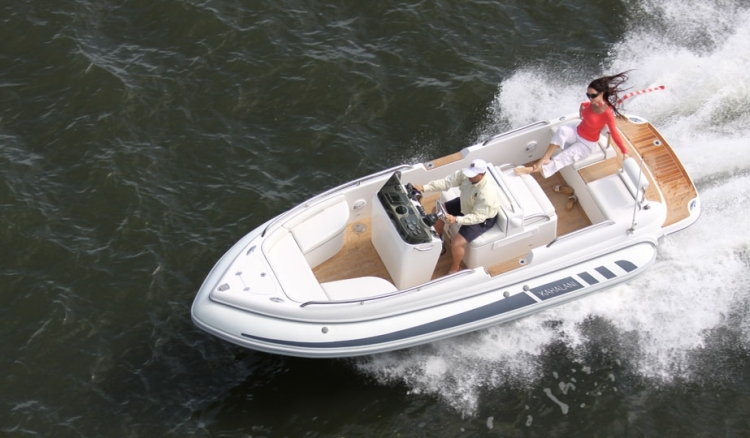 Rated for up to 90 horsepower and up to 10 persons, the OceanMaster 500 is a great choice as either a tender for a larger vessel or as a standalone sportboat. An integral keelguard allows for easy beaching, while lifting eyes allow it to be launched or retrieved with ease. For more information, visit Highfield Boats. Yes, the Skipper 10 is small. But this RIB isn't short on utility. The Skipper 10 proves that big things do indeed come in small packages. Despite it's diminutive overall LOA of just 10' 0” and a beam of 5' 4", the Skipper 10 has the ability to haul a full crew in style and comfort. The layout is extremely well designed, allowing seating for two at the helm plus one forward, and another facing rearward amidships. The small footprint and dry weight of just 350 pounds allows it to nestle on the swim platform of an express cruiser or be effortlessly towed astern. 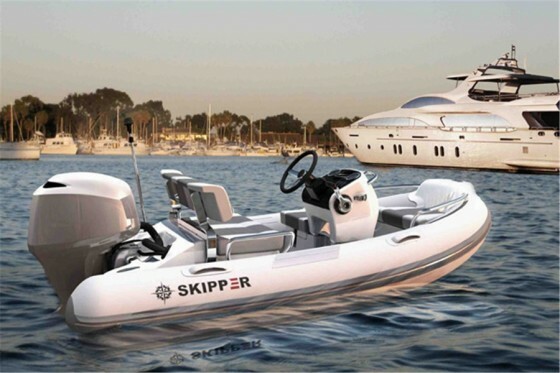 Rated for up to 30 horsepower with a fuel capacity of 8.5 gallons for all-day use, the Skipper 10 can also do duty as a sport-boat capable of towing watertoys or wakeboards. The integral cooler, full instrumentation, bow anchor locker, and LED navigation and courtesy lights make this a very well-equipped little micro-yacht. For more information, visit Tender Care Boats. 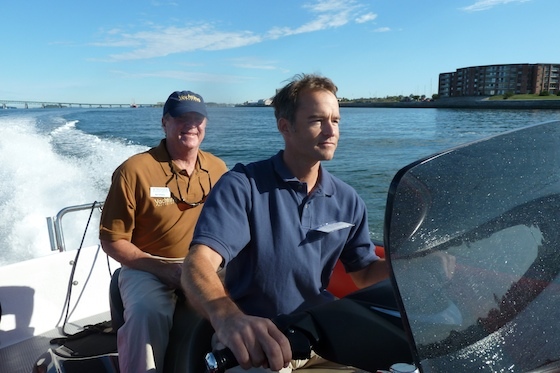 As the Nautica Cat 24 proves, RIBs can be powercats, too. 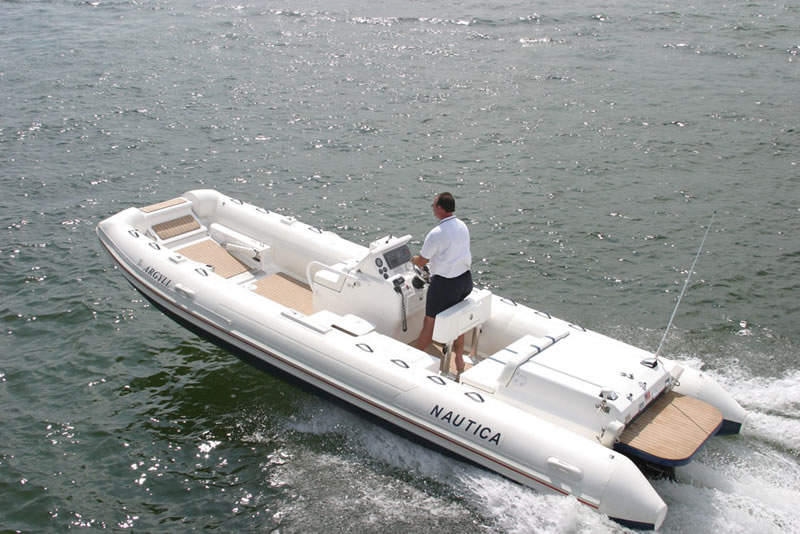 For many years, Nautica has provided specialized vessels for military and law enforcement. 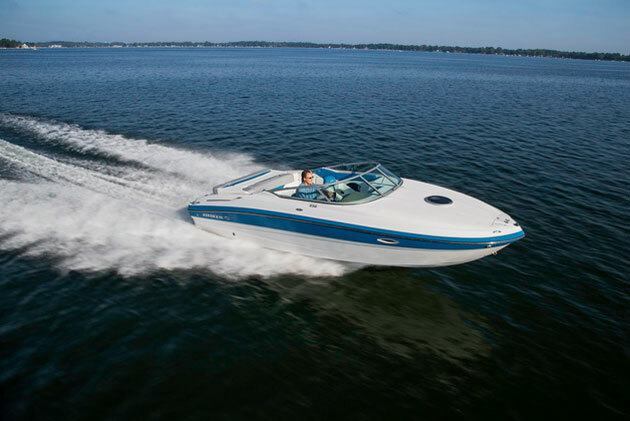 The CAT 24 borrows many unique features from these boats, making them available to the average boater. The first two things you notice about the CAT 24 are the twin catamaran hulls and a bow landing ramp. The catamaran hulls greatly accentuate the smooth ride of this RIB, even in very choppy conditions. 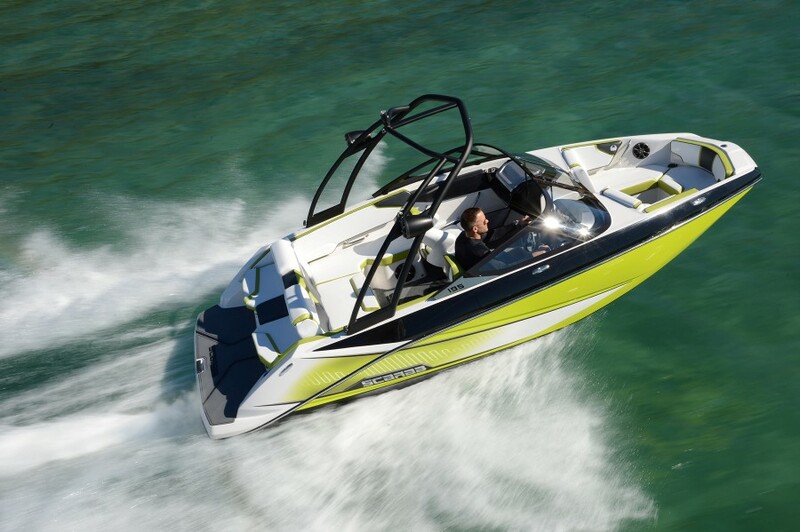 Catamaran hulls also allow more speed with less horsepower than a conventional RIB. Originally designed to allow fast, easy loading of stretchers or ATVs, when utilized as a pleasure craft, the ramp makes an ideal forward-facing swim platform for diving. The ramps are available in a number of configurations, ranging from teak-accented steps to a diamond-plate, low-maintenance deck that’s great for off-loading guests on the beach or for lounging in the water at anchor. The ramp also enhances safety; because your guests board and depart forward, there’s much less chance of accidental encounters with the engine's propeller. For more information, visit Nautica Tenders. The Novurania is a rigid inflatable boat that looks almost like a monohull. While most RIBs are recognizable as such even from a distance, a much closer inspection is needed in order to determine that the Customline CL600 is a member of the tribe, too. Huge expanses of teak set off by dark blue accents on the hull, and the lack of outboards on the transom, give it the sleek lines of an Italian sportboat. Powered by a Volvo D3 turbodiesel, the CL600 is a world-class sportboat that would also be right at home serving as the tender of a $20 million mega-yacht. An LOA of 19' 8" and a beam of 7' 8" allow it to carry up to nine persons in comfort and ultimate style. A fuel capacity of 30 gallons allows that cruise to last all day, while an eight gallon freshwater tank means you can enjoy onboard showers after a swim. The teak decks and swim platform give it the look of a classic launch, yet it has all the speed and reliability of any modern boat—plus the amazing stability and ease of handling that is only found on a RIB. For more information, visit Novurania. Commute at highway speeds, in the Protector Targa 30. Protector RIBs have the distinct honor of being chosen by many America's Cup syndicates as their support vessels, tasked with serving as a stable platform for photographers and videographers. 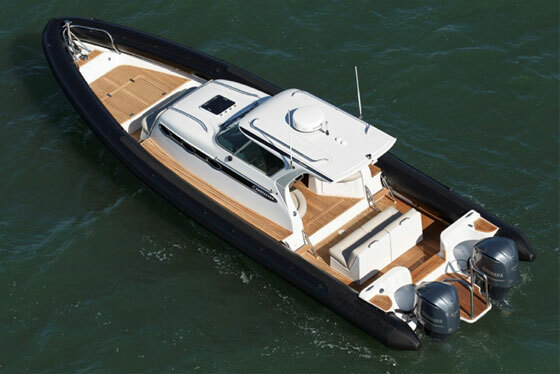 The Targa 30 is essentially a cross between a traditional express cruiser and a RIB. It features a spacious covered pilothouse area for all-season comfort, a large open cockpit, and a cabin located forward for overnight voyages. Notable features include shock-mitigating seating and rubber flooring that combine with the shock-absorbing abilities of the large inflatable tubes to deliver an impressively comfortable ride. 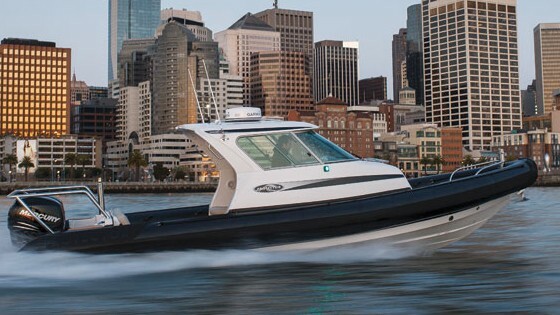 Powered by twin outboards, the Targa cruises cruise all day at 35 mph with a top speed of over 65 mph. Fuel capacity of 130 gallons makes it ideal for runs to the Keys or the Bahamas. The LOA is 30' 6" and beam is 9' 6", but with the tubes deflated it can be trailered by a standard SUV, adding to its utility. 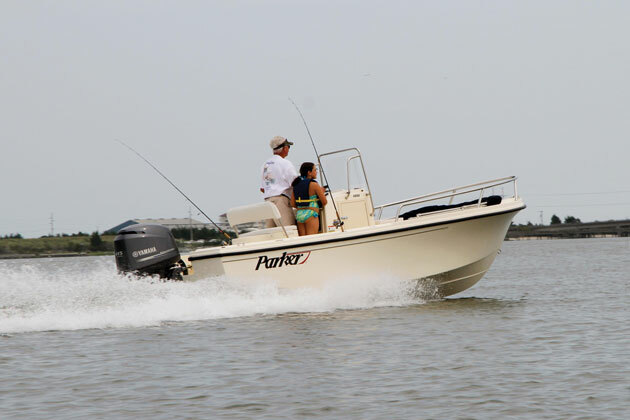 For more information visit Protector Boats, or read our full review, Targa Protector 30: Uncommon Commuter.